Pho Thanh Long on Maryland Parkway and Sahara got a 39-demerit C grade on its first health inspection after being open only six weeks. A Vietnamese restaurant's grand opening is nearly a closure after a visit from health inspectors. On June 5, inspectors found multiple adulterated and expired foods including cooked pork, cooked chicken and prepared Thai tea with milk that were all two weeks old. Owner Chanh Le blamed it on the chef, who he fired after the inspection. "I tell him every minute, when the food no good please throw away. Don't let the customers eat it. They could get sick. And he don't do what I tell him," Le said. But there's one thing that wasn't the chef's fault. "The grade card used to be posted right there under the No Smoking sign," observed Contact 13 Chief Investigator Darcy Spears. "Where did it go?" Le fished the C grade out from under the counter and put it back up on the wall. 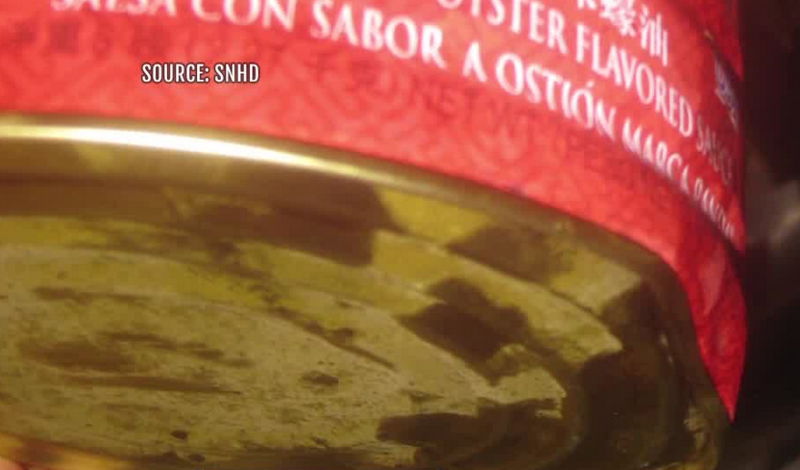 Inspectors also found large containers of beef broth and rice at unsafe temperatures. Same with bean sprouts, shrimp, fish and chicken. All of it had to be thrown out. There was also heavy old, dried food debris on the meat slicer and soiled dry cloths were being used to wipe down food contact surfaces. "Was the cook also responsible for all the clean-up and everything?" Spears asked. Le says yes, that was the cook's responsibility. He showed us around the kitchen to explain how things have changed, and though we spotted one violation -- tongs hanging on the oven handle -- everything seemed to be looking up as Pho Thanh Long prepares for re-inspection on Thursday. "I keep very clean. Nobody mess with me like before. I don't like it at all," said Le. There was another 39-demerit C grade at Tony Big's Pizza N Pasta on Durango and Warm Springs. When asked about the inspection, Manager Marine Abrahamyan said, "I don't want to talk." But she did want to question us about how we got a copy of the health report. "Who called you?" she asked. Darcy Spears explained that the report is a public record from the Health District. The June 5 inspection began with a complaint about dirty conditions and roaches. The inspector did not see evidence of pests at the time, but found the complaint valid for lack of sanitation due to no effective way to wash dishes and no sanitizer. Dishes in clean storage were soiled and stored with stinky standing water. Some of them were on a dirty rack covered in mold. The deli slicer was dirty with old food debris, soda nozzles were moldy and there was dirt, oil and food debris build-up on equipment, containers and walls throughout kitchen. The manager tells us we should be reporting on a different restaurant--specifically a place where she claims bugs were found in hamburger meat. When we ask where that happened, she answered, "Just look on Facebook. You can find what restaurant it is." "We can't trust what we see on Facebook," Spears explained. "It needs to be in the health report." The manager's main concern wasn't all the violations inspectors found at Tony Big's. She asked again, "How can you have this report?" And we explained, again, "It's public record. Anybody who wants it can get it. It's available from the Health District. All restaurant inspections are." Inspectors also found food uncovered and at unsafe temperatures, an employee's cell phone on a cutting board and soiled towels on counters. We asked where their C grade was posted and Abrahamyan said, "I'm not gonna show you." She then instructed her staff to remove it from the wall. "Actually, you're not allowed to take that down," Spears said. "It has to be visible to the public." The Health District also had some trouble with the folks who run Tony Big's. The day after their June 5 inspection, the manager called to get permission to use the red-tagged dish machine, saying it was fixed. But when the inspector got there, it wasn't, and the owner refused to sign the report documenting that. Tony Big's was reinspected late Wednesday afternoon and is now back to a three-demerit A grade.